With tableside service, 10 Pound at the Montage is worth the wait. Don’t you hate it when you’re looking forward to sitting down at your favorite bar and then you show up only to find that all the seats are taken? Fortunately, as part of that whole speakeasy trend which arose from the cocktail renaissance in the early 2000s, there are several L.A. bars located within other venues. Most don’t even have signs, leaving them a sort of secret to only those in the know. But that’s by design as these spots are so intimate there’s usually a waitlist or reservations to get in. But with these secret bars conveniently located within bars and restaurants, instead of standing around waiting for the velvet rope to drop, you can kill time constructively (read: by eating or drinking) til a space at the bar opens up. Keep in mind that some of these bars require reservations or a call ahead. 10 Pound in Scarpetta: The schmancy 10 Pound bar is actually located in the Montage Hotel in Beverly Hills but you have to walk through Scarpetta and past the restaurant’s hostess stand, and up the stairs to get to it. Since seating is limited and there are only two bartenders, reservations are highly recommended or if you are in the area, call them to see if there are any free spots. To pass the time, enjoy dinner at Chef Scott Conant’s Scarpetta downstairs. His spaghetti is a MUST. Or hang out in the lounge out front with a glass of sparkling rose or a barrel-aged white Negroni. Bar Jackalope in Seven Grand: Since there are only 18 seats at this Japanese-inspired whiskey bar, a reservation is highly recommended. Or you can check in with the host at the door and leave your name and number to get notified by text of an opening. While you wait, pre-game at Seven Grand, about 20 paces behind you. Order up an Old Fashioned with the whiskey of your choice or they even have Jeffrey Morgenthaler‘s Improved Amaretto Sour on their menu! Old Man Bar in Hatchet Hall: The newly opened Old Man Bar in Culver City is actually accessible to the public and there isn’t a waitlist or reservations required. However, if you’re looking to snag a drink after work, you’re out of luck as the bar doesn’t open til 8 p.m. No worries, though! Grab a seat at the bar at Hatchet Hall. Barman Cappy Sorentino did the cocktail program there, as well as the one at Old Man Bar. Sip on a strawberry daiquiri while keeping one eye on the door to Old Man Bar. Walker Inn in Normandie Club: These two are must-dos in Koreatown and conveniently the reservation-only Walker Inn is located in the back of Normandie Club past the bathrooms and behind a door marked “Secret Door.” If you want to try your luck at snagging a seat at Walker Inn, which features an omakase cocktail service at the bar, it does reserve a small amount of its seating for walk-ins. Just check with the host and, like Bar Jackalope, they’ll take your info and text you when your seat is ready. In the meantime, the Normandie Club isn’t a bad way to pass the time. Best seat is at the bar where you can watch the bartenders do their magic. Ease into your evening of drinking with the best martini you’ve ever had, a memorable mix of vodka, Fino sherry, raw white honey and sel gris. 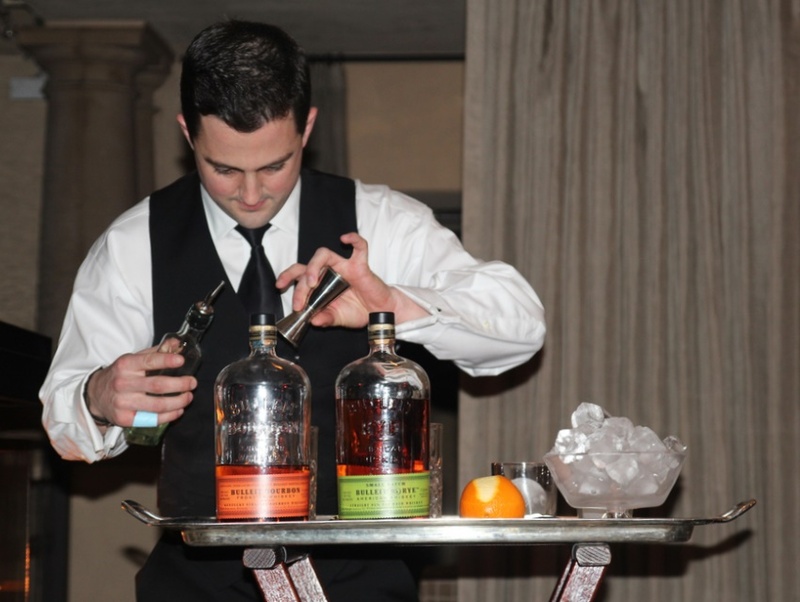 The Varnish in Cole’s French Dip: This award-winning cocktail bar by Sasha Petraske and Eric Alperin arrived when the popularity of the speakeasy bar concept was at its height. It’s an intimate space located through an unmarked door in Cole’s and if it’s at capacity, which means all the seats are taken as there is really no standing room, you’ll be told how long the wait is. Don’t sweat a long wait, however. Kill some time by fortifying your stomach for the night of drinking well-made classic cocktails by scarfing down French dips. Bonus is that if you’re looking for drunk food once you finally emerge from the bar, you’re in a French dip restaurant! Mmm, garlic fries.